Emotion is one of the forgotten arts of game development. No university teaches a programmer how to love. There is no John Carmack of tears. But one publisher is making a concerted effort to push a discipline still in its infancy. After years of iteration, EA Sports have just cracked emotions in FIFA 15. And The Sims Studio reckon they’ve done the same in The Sims 4. Here are their findings. EA have done a tremendously poor job of explaining what’s novel about The Sims 4. Sim traits were sold as a new feature from the stage of E3 – when every Sims 3 player could see they were simply a reorganisation of an existing system. The same confusion applies here: anger and embarrassment aren’t new to The Sims. What are new are moods that linger: lasting irritability that colours every interaction a sim might have for the rest of the day. 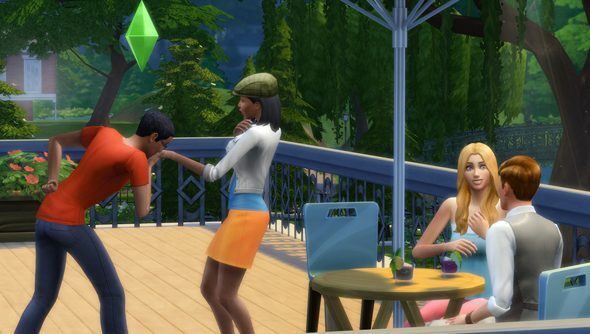 Players can’t entirely control how their sims are feeling – but they can play with the effects. A bad rejection might cause a sim to bite the head off a friend and damage their relationship, for instance; but if the player steers them to the gym instead, they can channel that anger into a boosted strength stat. The Sims Studio did a much better job of explaining all that in a recent Sims 4 stream that accidentally outed the existence of a premium purchase option. Are you sold on the idea of a Sims without toddlers or swimming pools yet?